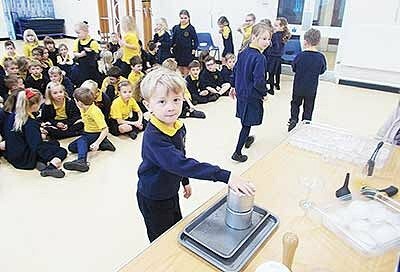 Mr Myles Cunliffe, a parent at Upper Beeding Primary School, came in to see children in Years 1 and 2 to launch the Ice part of this terms topic Fire and Ice. The children experienced the effects of dry ice, had an opportunity to measure the temperature of ice cubes, and also to handle the ice, watching it change shape from a cube to a sphere as it melted. The children were enthralled with all they saw and experienced. Mr Cunliffe kindly left some ice behind for the children to further explore in the classroom. Report by Mrs Debbie Gilpin, Year 1/2 Leader.